Sometimes in life we get to a place where things just seem disorganized. We try but we just don’t seem to be able to get our hands around things. We struggle to find our focus. Greetings in the name of our Lord and Savior, Jesus Christ. I was talking to a crew chief the other day about the way his car was handling and he shared with me that they came to the track with a new setup and have been trying to dial it in. They were not having much success but were committed to work through it. I was amazed when he said they couldn’t even go as fast as the “old” setup. I was confused. If you try something and it doesn’t work why not go back to what you know works? The effort and time spent trying to make something work on race day seems like a frustrating endeavor. It only teaches you what you can’t do. Sometimes we lose focus. Take a step back and rethink the reason why you came to the track that day, to race. Not only to race but to win! I understand you have to try new things and when you try, you may find something out, but that type of activity is for a test session, not race day. There is a time and place for every activity and we need to be aware of the situation and focus on the desired result. Why are we here? Losing focus applies to every aspect of our lives. We need to remind ourselves what is it that we are doing and focus on the activities that reflect that. Sometimes we get distracted from our mission. We need to take a step back and refocus. Hebrews 2:1 – We must pay more careful attention, therefore, to what we have heard, so that we do not drift away. Have you ever noticed that what you focus on is likely to become where you end up? Daryl Shoemaker tells us about how he learned this lesson. On a recent summer vacation I enjoyed a round of golf with, for the purpose of this story, an unnamed family member. While standing by a tee box, we admired all of the beautiful homes and their immaculately landscaped patios that backed right onto the left side of the fairway. My golf partner indicated that the home owners complained at length about golf balls hitting their homes. However, it had not been a problem for him as he followed the sage golfing advice – don’t focus on the home, tree or water, but instead focus on the place where you want your shot to land. That makes sense. You always hear about how pro athletes are successful in part because they are able to visualize the play. He went on to effectively demonstrate this principle, as after 5 minutes of looking at the homes, he managed to hit a 250 yard shot right into the back of the home furthest from the fairway. Actions follow thoughts. It is not that we should ignore the challenges that face us. However, it is a question of focus. We need to remember the situation we are in. Remind ourselves of the right focus. When our focus is correct, the obstacles remain in our periphery, the risks become secondary. While we focus on our purpose the path may not seem so long. While we focus on the reward the cost may seem small. What is it that we need to be focused on? We need to remind ourselves that we are to be about the Lord’s work. Don’t let things distract you from what honors God. I refer back to the writer of Proverbs when I get things out of focus on my life. Proverbs 3:5-6; Trust in the LORD with all your heart and lean not on your own understanding; in all your ways acknowledge him, and he will make your paths straight. Are we a little out of focus? Take a step back and look at where we are expending energy. Ask ourself if we are moving in the direction that God wants us to. Make the necessary adjustment to get things back on track. Talking of getting things back on track, we have some work to do to get Rapid Rick back on track. Many of you know Rick Raducha, he’s the guy with the ever present smile and rolls around the track in a wheel chair. He has been a fixture at tracks up and down the east coast for many years. He has helped many racers find sponsorship money to race. He is a tremendous encouragement to more people than he realizes. I was talking with Grandpa Blewett this week and he impressed upon me that we need to get Rick into the new van so he is taking it upon himself to spearhead the drive. He shared how much seeing Rick’s smile changes his outlook. “Look that guy smile!” Grandpa feels we, as a racing family, can step up and help. 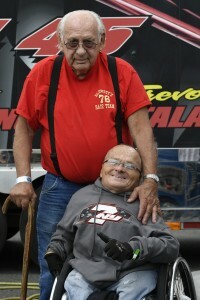 If you look in last week’s edition of Area Auto you will see a picture of Grandpa and Rick. Grandpa has set up a fund to receive donations for the special equipment that the van needs to be equipped with so Rick can drive it. He is committed to get this done and he would like our help. Rick has a condition best described as brittle bone disease, they have a medical term for it and if you ask Rick he’ll share it with you. Rick has accomplished a world record, most broken bones and still living. I remember the directions he gave me when we headed out on a road trip with the late Howie Hodge. Don’t resuscitate! He explained it would be like doing CPR on a bag of pretzels. I’d do more damage than good. Rick and I have taken a couple road trips together and I have seen firsthand the challenges he faces in just everyday living. He does it all with a smile. Think for a moment of not being able to do the simple things you take for granted every day without help. Now take them on the road. Getting Rick in a passenger car is no easy task, I have some experience trying. Rick has a bump on his head to prove it. Cradle gently, don’t squeeze too hard, watch his head, and don’t drop him. I get him in and he jokes that he needs a booster seat to see out the window. Always a smile and a laugh. With the help of Dan and Gary we made the trip to Bristol and Rick was able to cross that off his bucket list. Having the freedom to travel is one of the greatest pleasures we can enjoy. Let’s give that back to Rick. Join with Grandpa Blewett and put this over the top! Make checks payable to Rick Raducha and mail them to John Blewett Sr., 246 Herbertsville Road, Howell, NJ 07731. Thank You in Advance.